Smartwatch-based digital wallets —like Apple's integrated Passbook and Apple Pay systems —could face an uphill battle in Europe, survey data released on Tuesday suggests, as consumers on the Old Continent seem to eye such devices with relative suspicion, compared to more interest among American and Chinese consumers. Just 20 percent of German consumers and 27 percent of their U.K. counterparts are interested in using a contactless payment system built into a smartwatch, the data shows, compared to 54 percent and 40 percent in China and the U.S. respectively. The numbers come from interviews with 1,000 smartphone owners each in China, Germany, South Korea, the U.K. and the U.S. conducted by German market research firm GfK. Surprisingly, South Korea also lags behind in that regard, with only 27 percent of consumers showing interest. While no reason is given for the disparity, it is possible that the existence of established tap-to-pay systems has an effect. Credit card-based contactless payments have long been popular in Europe, and South Korean consumers can take advantage of similar systems built into mobile phones and SIM cards, much like those found in neighboring Japan. China and the U.S., meanwhile, lack large-scale contactless payment deployments. Semiautonomous Hong Kong has had the popular Octopus system— one of the first successful and widespread uses of NFC for commerce in the world— since the late 1990s, but similar systems have failed to gain wide adoption on the mainland. 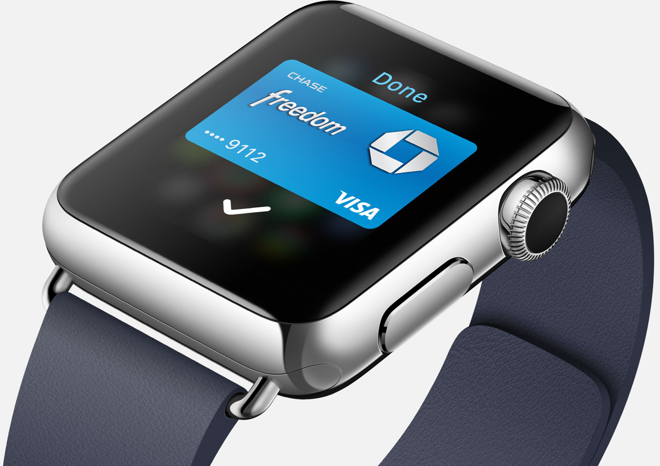 Apple's own NFC-based payment system, Apple Pay, is expected to roll out in the U.S. as soon as this week. Europeans are likely to gain access next year, with payment consortium Visa driving adoption, while China is likely to follow after details of an agreement between Apple and China's UnionPay were revealed in September. Interest in other uses for smartwatch-based digital wallets, like storing health or identification data, booked similar disparities. 70 percent of Chinese consumers, 50 percent of Americans and 43 percent of South Koreans surveyed said they would be interested in storing health data in such a service, for instance. Only 33 percent of U.K. residents and 25 percent of Germans shared those sentiments. Chinese consumers once again led the way when asked if they would prefer to store identification data on smart watches, with 57 percent answering in the affirmative. The U.S. came in second with 41 percent, followed by South Korea, the U.K., and Germany at 33 percent, 28 percent, and 20 percent, respectively. The high level of interest in the U.S. likely speaks to the potential for convenience that American consumers see in smartwatches. While China, South Korea, Germany, and the U.K. already issue "smart" national identity cards, U.S. citizens have fiercely fought back against such efforts, even for state-issued driver's licenses.